If you are frequent to marketing blogs then you must have read about the email signature. Even I wrote few posts on this as how to drive traffic using email signature and it really works. You will hardly find any business person who doesn’t focus on the signature. It is not just the last part of your email but it shows the professionalism as well as the better signature you have, the more attention you can gather. People use the signature to attention the attraction of your reader as well as to add something that you want to convey them. Why use professional Email Signature? There are multiple reasons behind using a professional signature in your business emails. Below I am listing few really awesome benefits of using a professional email signature in your business emails or even in any email. Now as you know why you should have a professional email signature, let me tell you few components those must have in the signature so that it can be more powerful. Here are some of the basic elements those should have in an email signature. All of these are not compulsory but it is good to have. Here are some basic yet very helpful tips to create a stunning email signature. Just keep in mind while designing the signature for you and it will come out excellent. 2. Make sure to use your social media links. This is must to have. Adding social media links will not only help you to increase your social connections and followers but also will help your readers to believe that they are talking to some real person in the virtual world. 3. You can include images to make it even better. It again gives some personal touch to your professional signature as well as the relationship with who you are talking. 4. Try different options and select the best fit for you. To try different options you may take help of some email signature builder, I am going to explain one below and you can try out different options. 5. Be creative while designing the signature. 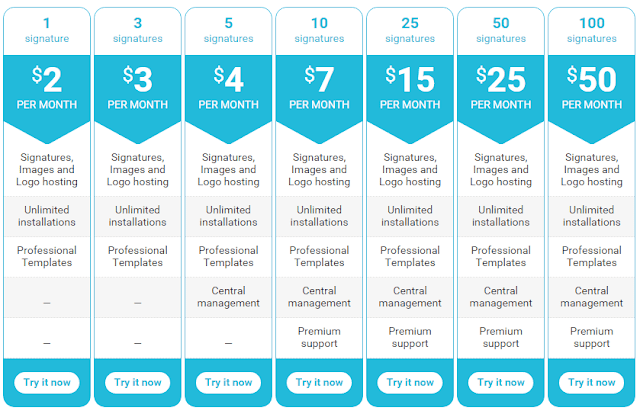 While using the signature builder, you will have many options. So now it’s you who will make it awesome. So just be creative and design the best. 6. Also, do A/B testing. Testing doesn’t only apply to the ad campaign. You should do split testing everywhere. Suppose you want your user to click on the link you have put in your signature or click on the banner you have added or anything. Now just be a bit creative and design 4-5 types of it and start using a different signature on a rotation basis and see which converts best for you and use that…is not it awesome? 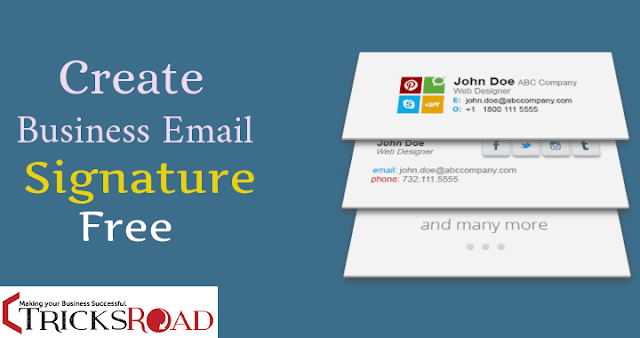 How to create Free Business Email Signature? By now you have come to know the basic stuff of email signature, what it should have and how it should look. Together with it how you should use email signature for bets use. Now it’s time to show you how you can create a free business professional signature for bets benefits. NEWOLDSTAMP is one such tool which helps you to create a free professional email signature. It helps you to save your designed work and later anytime if you want some changes, you can do it anytime by logging into your account. NEWOLDSTAMP is an online email signature generator which helps you to create professional looking business signature. The best thing about NEWOLDSTAMP is that it is highly customizable and there are plenty of templates you can use to create a stunning design. 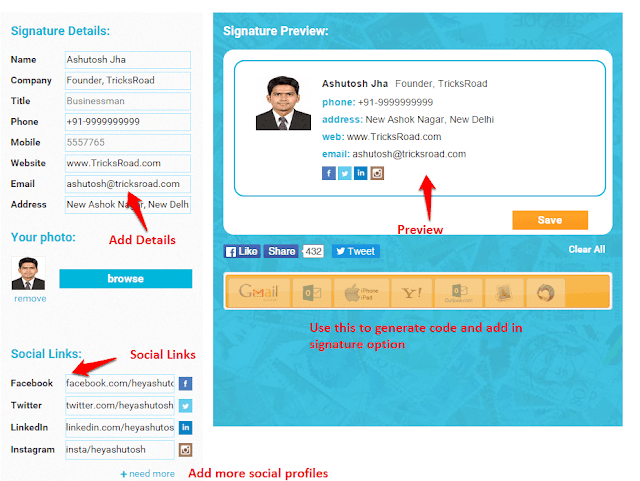 Here are some of the amazing features of NEWOLDSTAMP which will help you to make even better email signatures. You can check the detailed NEWOLDSTAMP premium features here. How to create a free email signature with NEWOLDSTAMP? Step3: Once done, just save it and click on the email type you are using to generate the code. 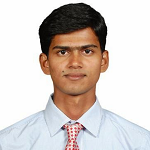 For example, I am using Gmail and so I will click Gmail and will get the code and add the code to your signature option. With all these plans, you will get 7 days trial period and also company provides 7 days money back guarantee. Having a business email signature is very important and if you are doing business communication, you must use it. It is considered as a sign of professionalism and more important it helps you a lot, as I discussed above. Also, creating a professional email signature is not a big job and using any email signature generator tool, you can create a free email signature quickly and no doubt NEWOLDSTAMP is helping you a lot in your journey to create a free business email signature. I will love to hear what you think about having a professional signature and do you use any?